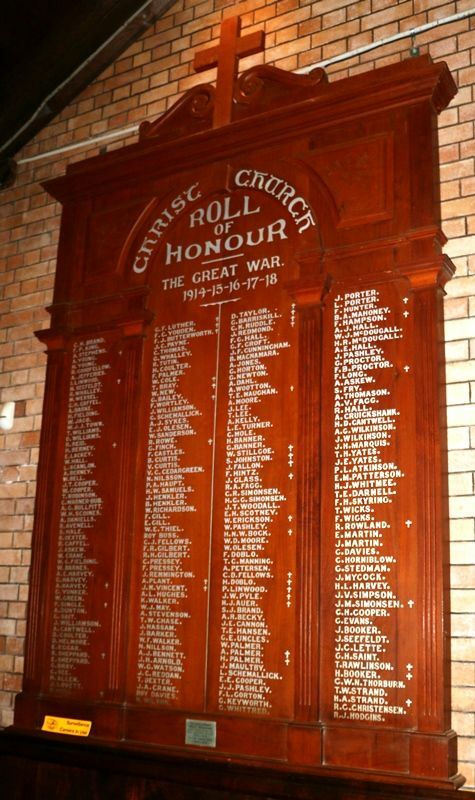 The wooden honour roll commemorates those connected with the church who served in World War One. The roll was originally unveiled in 1916 with additional names being added at a later date. The Bishop Coadjutor of Brisbane, spent the week end in Bundaberg, arriving on Saturday. His Lordship had a very busy day at Christ Church yesterday. At 8 a.m. he celebrated Holy Communion, there being a large number of communicants including upwards of 50 candidates who were confirmed later on in the day. At the 11 o'clock service the Church was filled to its utmost capacity. 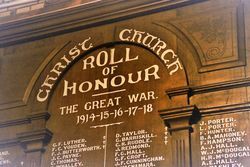 During the service His Lordship unveiled the magnificent Roll of Honor erected to the memory of members of Christ Church who have responded to the Call of the Empire, The Board is made of silky oak nicely polished and of neat design, surmounted by a cross. Its dimensions are approximately 10ft. 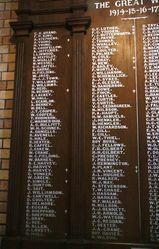 x 6ft., and already it contains no less than 159 names of gallant young men 14 of whom have made the supreme sacrifice. 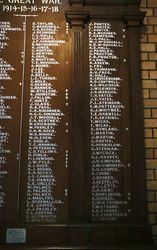 The Board was made by Messrs. F. C. Brown and Co., and the printing of the names was the work of Mr. E. T. Steptoe. The parishioners defrayed the expenses, Mr. J. W. Crane acting as collector. The unveiling ceremony took the form of a special service of dedication, the proceedings being very impressive. At the conclusion of the ceremony, His Lordship preached a powerful sermon on the Joys of Self Sacrifice, dealing with loyalty to the church. Bundaberg Mail and Burnett Advertiser (Qld), 6 November 1916.